The SK-10 Concealed Blade Safety Knife features a four-position adjustable blade design, Nylon 6 Polyamide handle and a tool-free blade change. The blade design allows for four cutting points on a single-edge blade. No blade adjustment is needed for an ideal fit for both right- and left-handed users. The Quick Connect tool tether permits the user to safely change out a tool in seconds, saving valuable time. When a tool is unplugged from the tether, the user simply selects the next tool to use, plugs it in and returns to work. The quick-release component configurations include split ring, mini-lanyard straps, side release, bungee strap, snap clip and more. The Easysafe plastic and paper sheet cutter has a concealed blade for fast and accident-proof work. The cutting-head design allows for easy initiation of a cut while maintaining blade contact with the material – even on single layers of film or paper. The cutter can be locked with a special key to change the blade. Ideal for workers transporting heavy materials to an aerial destination, Arsenal Canvas Buckets are designed to safely hoist materials that come in a 5-gallon pail. With high walls made of heavyweight 20-ounce canvas and the Arsenal 5737 Safety Top properly attached, these buckets can carry up to 150 pounds without the threat of dropping any contents. The MityLite 1965 LED boasts safety approvals from four certification agencies and can be used in environments where flammable gases, dusts and fibers are present. 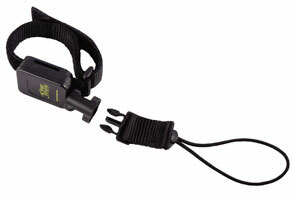 The light’s safety set-screw provides a grip aid for users wearing gloves. Its LED shines 21 lumens/756 candelas peak beam intensity for more than four hours of usable light on two AAA batteries. The S7 Safety Cutter offers safety and versatility and features a spring-back safety guard and safety point blade that retracts simultaneously to prevent razor cuts. The S7’s ergonomically designed handle, universal right- or left-handed usage, and new quick and easy blade change make it the perfect tool to handle most stocking and warehouse tasks. The Shark safety knife is designed to prevent fingers from reaching the blade. The patented, specially designed mouth of the Fish series guides material onto and along a surgical steel blade, which slices through heavy strapping, rope and fabric. The addition of a retractable hook blade extends its use to box-opening and cutting through tape. The ReadyLight Solar Rechargeable Flashlight (model VB03) is perfect for power outages and roadside emergencies. The eco-friendly flashlight delivers up to four hours of illumination from a single solar charge. Charging the internal battery of the flashlight is as simple as placing it in direct sunlight. The bulbs generate more than twice the light output of conventional flashlights.